Should You Get an Ubuntu Touch Phone or Tablet? Unveiled in 2013, the Ubuntu Touch platform is designed for smartphones and tablets, and represents the first full Linux operating system for touchscreen devices. Since the first device, the BQ Aquaris E4.5 Ubuntu Edition, was released in 2015, a steady flow of other handsets and tablets has been unleashed. But is the Ubuntu Touch platform a truly successful mobile iteration of Linux’s most well-known distribution? Can it compete with Android and iOS? We’re going to take a look. Hold On: There’s an Ubuntu Phone Now? 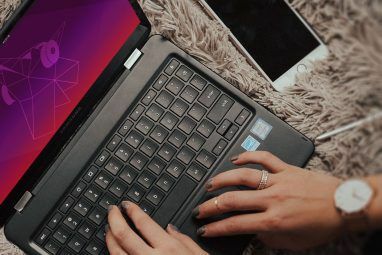 One of the key challenges facing Ubuntu developers Canonical is the general apathy in mainstream computing users when it comes to Linux. It’s a shame, but on the whole, true. And this same indifference is not going to help a mobile project where the majority of choices are between Android and iPhone. Unlike Windows Phone/Windows 10 Mobile Why You Should Upgrade to Windows 10 Mobile and How to Do It Why You Should Upgrade to Windows 10 Mobile and How to Do It Windows 10 Mobile has finally been released to the public. Provided your phone is supported, you should upgrade. Here's everything you need to know about upgrading from Windows Phone 8.1 to Windows 10 Mobile. Read More , Ubuntu Touch is an unknown quantity. Even BlackBerry is likely to do better (although RIM are apparently bringing Android in as their OS Windows 10 Is Spying on You, BlackBerry Adopts Android... [Tech News Digest] Windows 10 Is Spying on You, BlackBerry Adopts Android... [Tech News Digest] Microsoft shows off its data collection, BlackBerry adopts Android for 2016, Motorola is no more, John Legere curses the Electronic Frontier Foundation, and get set for Game of Thrones. Read More ), and while Ubuntu Touch includes all of the settings controls, calendar, messaging and email support, and the well-known apps that you would expect to find on a new device, a massive PR campaign is required to get Ubuntu Touch in front of users as a viable alternative. A campaign that is surely beyond the resources of Canonical. So, what’s Ubuntu Touch for then, really? You’re probably reading this in the USA, Canada, UK, or other place where smartphones and tablets are usually Android or iOS, or Windows 10. But this isn’t the case in India and China, where PCs widely use Linux distros — typically Ubuntu — and affordable smartphones use old versions of Android. Ubuntu Touch is targeted at these territories. 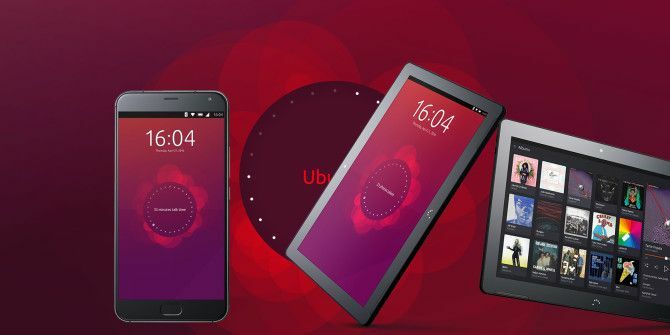 Canonical Ltd founder Mark Shuttleworth is pushing Ubuntu Touch into countries where Ubuntu already has a strong footing, so it makes sense that these areas should be the first markets to be targeted. Whether this can translate into regional success for Ubuntu Touch smartphones and tablets, however, remains to be seen. Despite this, you’ll still find Ubuntu Touch devices available for purchase in the US, UK and European Union. So how usable is an Ubuntu Phone? Would you get along with the Ubuntu Tablet? Let’s take a look at the user interface. Like its desktop forebear, Ubuntu Touch relies on the Unity sidebar (a mobile version of the desktop Ubuntu launcher Unity vs. Modern UI: Should You Choose Ubuntu Or Windows 8? Unity vs. Modern UI: Should You Choose Ubuntu Or Windows 8? 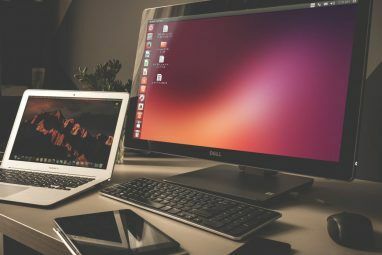 For a good amount of people, the choice between Windows 8 and Ubuntu can primarily come down to the user experience, which is largely attributed to the desktop environment. Read More ), which can be displayed by swiping in from the left. Where you would expect to find a home screen, however, you’ll find something that feels more like an app, seven screens wide, where you’ll find your calendar events, recent activity, weather information, apps, local news, music stored on your device, and videos and photos you’ve recorded. It’s a nice approach, albeit one that can take some getting used to. A hardware button on the lower bezel is provided to open the Unity menu, but this is a strange process that requires you to hold the button down before pressing the required menu item. At the bottom of the home screen, a menu can be dragged up that displays quick shortcuts to the list of installed apps, as well as the seven screens of the Home screen. Meanwhile, there’s a Notifications menu that can be dragged down from the top, along with quick settings for rotation lock, location, Bluetooth How Bluetooth 4.0 Is Shaping the Future of Mobile Connectivity How Bluetooth 4.0 Is Shaping the Future of Mobile Connectivity Bluetooth is the forgotten star on the device specifications sheet. Read More , network connectivity, volume, and battery and brightness. Finally, swiping in from the right displays the open apps, which can be closed by swiping up. Are There Any Apps and Games? As described earlier, apps for Facebook and Twitter are preinstalled, along with Flickr, Instagram, and several others. Note, however, that most of these apps are simply wrappers for the mobile website (this essentially means that the mobile sites are repackaged so they’re launched from an icon and have their own window). The Ubuntu Store is the resource for new apps and games, where you’ll find useful tools like Terminal apps, podcast apps, and games. Most of the games are puzzles at this stage, and the Ubuntu Store is probably the only mobile app store that has fewer apps than the Windows Phone Store. The Ubuntu Store link is opened from the Apps list in the Home screen, and requires you to have an Ubuntu account. If you don’t already, you can easily set one up. Running a Facebook app on your Android or iPhone will contribute towards draining your battery, but you can uninstall them. To compare, Windows Phone/Windows Mobile 10 has Facebook integrated. While you can disable it, you cannot remove it completely. Ubuntu Touch edges towards the Windows route here, with additional points for including Instagram, Twitter and several others. These apps are baked into the Home screen, making it easy for you to check and dismiss updates without launching the apps. Impact on battery life is notable, but not as bad as I’d feared. 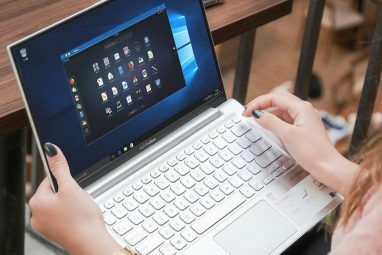 Microsoft has been making headlines with its Continuum system, which enables you to convert a new Windows 10 Mobile device into a desktop computer, by plugging in a bunch of hardware. Ubuntu Touch can also be used like a desktop computer, without the extra peripherals. Convergence, as the system is named, turns your phone into an Ubuntu desktop system, capable of running ARM processor compatible apps and maximizing your productivity. Whether this works, or not, depends on your device, and whether it has HDMI out (although future devices may have wireless HDMI Wireless HDMI: What It Is and Why You Need to Start Using It Wireless HDMI: What It Is and Why You Need to Start Using It If you're sick and tired of HDMI cable jumbles and knots, then you may want to invest in wireless HDMI. Here's how to get started. Read More ). Convergence doesn’t currently seem to work with the Meizu Pro 5 Ubuntu Edition Meizu Pro 5 Ubuntu Edition Smartphone Review Meizu Pro 5 Ubuntu Edition Smartphone Review When a phone is released only to a select few enthusiasts, you wonder whether or not the hype is genuinely worth it. Let's look at one of the first phones to run Ubuntu Touch. Read More , for example, which is a bit of a pity as it’s a very good phone. Ubuntu Touch is a user friendly mobile operating system that manages to be like iOS and Android without ripping them off. By taking this “feels like” approach, Canonical can push Ubuntu Touch into, and beyond, the space occupied by the very different (and divisive) Windows Phone/Windows Mobile 10. It’s been a few years now since Ubuntu Touch was announced How To Install The Ubuntu Touch Preview On Your Nexus Android Device How To Install The Ubuntu Touch Preview On Your Nexus Android Device Ubuntu is developing on a touch-focused interface for smartphones and tablets, with plans to ship Ubuntu smartphones in 2014. If you’re interested in trying it right now, there’s good news: You can install the preview... Read More . Several existing phones will support its installation (such as, for instance, the Nexus 4), and a few new phones and tablets come with it preinstalled. However, for it to be a success long term, Canonical will need to ensure that it continues to develop the software, iron out the creases (stability issues, for instance) and attract developers, while simultaneously pushing for its inclusion on new handsets. Eventually, Ubuntu Touch could be the third mobile operating system. Right now, it’s languishing far below this placing. But if anyone can get their OS noticed and used, it’s Canonical. And now is a very good time to get on board. Would you buy an Ubuntu Touch phone? Perhaps you’ve already installed the OS on an old Android handset. What do you think of it? Tell us all about it in the comments. Explore more about: Linux, Ubuntu. I installed Ubuntu touch in January 2015 to a nexus 4 and instantly it was my daily driver but sadly 6 months later there was an update and the gallery stopped working. Then with evey update something would stop working. Currently I have NO working alarm clock, calulator, gallery, camera etc. All I have is facebook, texts, calls and web browser. I am very disappointed with Canonical. Can I believe that people have fully functioal Ubuntu touch phones? No. I wish they would sort it out. I hate google and apple! the first one : I have GT-I9082L with android 4.2.2 OS would I be able to install Ubuntu touch on my device ? the second one is : in the phone that comes originally with Ubuntu Touch (the one that I know is Aquaris E4.5) the device doesn't support 3G so, i I installed Ubuntu touch on me device will 3G be supported or not ? At the website of BQ you can find the specs of the phones and the supported frequencies. I've just installed this on my Nexus 5 and so far I haven't yet lot patience with it (which is a big plus for me). I'll play with it over the weekend to see if it turns into a daily driver or not. I already had the bq Aquaris 4.5 in April last year and then upgraded to the next one, the Meizu MX4. Things improve with every update - and you get them regularly (hear that, Android?). All the basic stuff to really make it usable is stable since my last update (for my needs). ssh synchronization works like a charm (can you do that iPhone or unrooted Android phone?). The Meizu MX5 will get convergence working very soon, there was a very promising video from a Ubuntu developer just a few days ago. I would, if I could. I just do not know about the availability of such devices in Canada, unlocked and that could cover the frequencies for *all* our phone providers. But as I will eventually get a newer phone under Android, my existing one can be used as a first test for the Ubuntu OS, which I also use as my main OS at home. And since I'm a Linux CLI fan, this phone will be fun to try. Ditto, except for in Australia.